We are super excited to share some creations made with products from CHA 2016 and even more excited to have them available at Laura's Loft! Dont forget this is National Craft Month and in honor of this Laura's Loft has a store wide 15% off through April 3rd. Details for the GIVEAWAY found at the bottom of the post! I started with a piece of Neenah Solar White card stock and stamped the images and sentiment from Lawn Fawn Mom + Me stamp set. I colored them with my Copics and made a glow around them with Copics. I added some hearts, sequins from Design Creative Bling Hopes Desire sequin mix and some string. 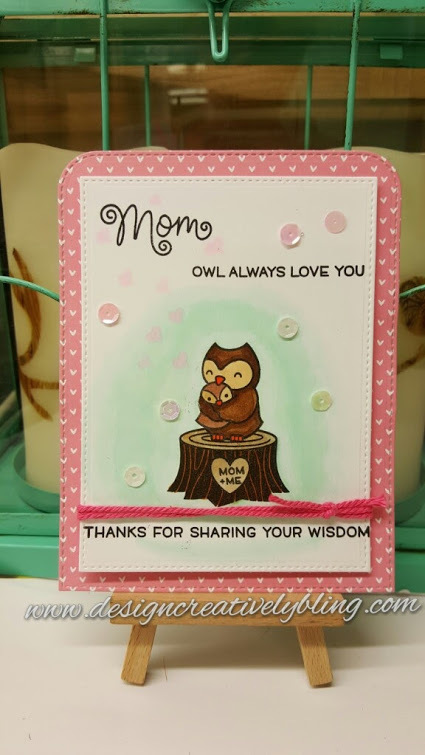 I finished it off by die cutting my base, which is from Lawn Fawn Let's Polka Mon Ami and my card front. 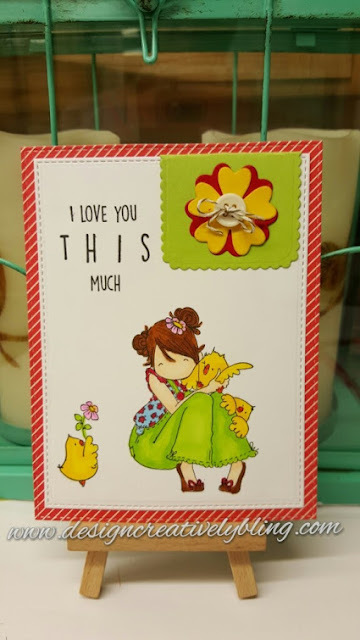 I stamped my images and sentiment from Stampingbella Tiny Townie Heidi Needs A Hug on Neenah and colored them with Copics. Using MFT Die-namics Blueprints I cut my tab and flower. I also used them to cut my card front and base. I glued my flower together then stitched a button in the middle. I could not get the video to load but if you click here you can watch it! From the time I saw the Lawn Fawn Loads of Fun stamp set I had this card in mind. I wanted the dryer to spin around. So I started off creating my background with Tim Holtz Distress Crayons and the Mini Stencil set 1. Then I stamped out the images and colored them with Copics. I cut them out on my Scan N Cut 2. Next is the fun part, using two circle dies one slightly larger than the other I cut a piece of white card stock as the outside ring of the dryer. Using the larger die I cut another piece of white card stock and a piece of acetate. I poked a tiny hole in the center of the white circle and the centwer of the door on the dryer. I put a tiny brad through the hole in the circle, attached a piece of bakers twine, put the brad through a Stampin Up dimensional which still had the protective cover on the side towards the dryer and last through the dryer door. I forgot to mention I also cut a piece of white fun foam using the two circle dies. I glued the fun foam down then the acetate and the outside circle. I used MFT Blueprints and cut my front and base ( Lawn Fawn Beachside) then assembled my card. The images for this card are from Stampingbella Rachel Loves The Rain. They are colored with copics. The card front and base ( Lawn Fawn Beachside) are cut using MFT Die-namics. I added sequins from Design Creative Bling Jewel Box mix and some glossy Accents. OMG Deana, What beautiful cards!!! I am a HUGE Lawn Fawn and Stamping Bella fan and you creations have made my wish list that much longer!!!! I've been curious to see creations with the Distress Crayons and I am swooning over the stencil work!! ABSOLUTELY gorgeous cards! Darling cards! Love that sweet Stamping Bella image of the girl with the chicks! So sweet! 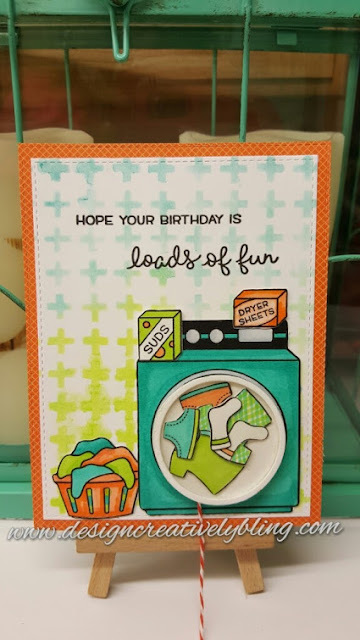 Fun Lawn Fawn card with the dryer! Love it! I adore the Mom & me card it's so cute. Your cards are super cool. 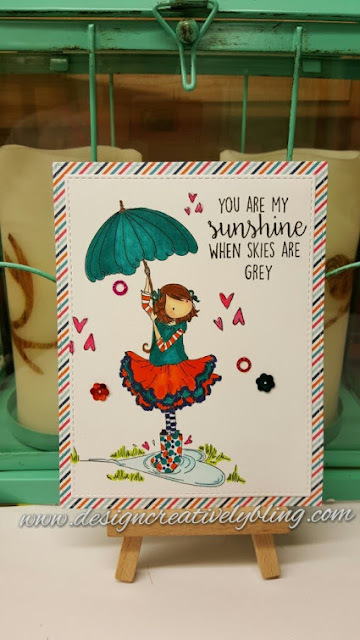 I just bought the Mm & Me stamp set and your card has given me inspiration. Thank you! Love your cards! The Lawn Fawn stamps are so fun. These are all super adorable! Owl always love you going on my wishlist! Your cards look great! Especially love the Stamping Bella. OMGosh I love them all! So creative and fun. Love the washing machine the most. Haha, I got a kick out of the dryer! Love all the cards !